How to style a Kurti/Tunic? I know that I have been giving a lot of fashion advice lately ... like here, here, and here, Phew! [Right!?!] Well in my defense, people asked me and now you all are stuck with this post [:P] Blame 'em! And for people who do not what a Kurti is? ... It is otherwise known as a Tunic in the western world, and is a traditional piece of clothing for most South Asians specially in Indian Sub-Continent. They are designed to fit loosely and women mostly wear them with jeans. - and my favorite - SHOES! Now we cannot possibly have a post without my pictures, now can we? 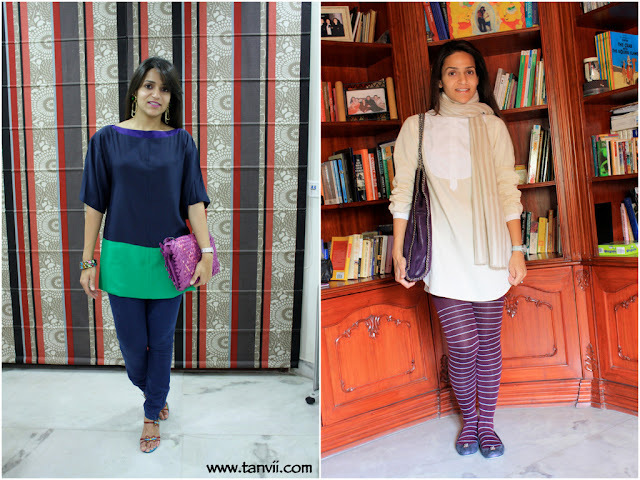 So here's how I have worn Kurtis a several times in the last year! Updated: Inky Pinky asked the difference between a Kurta and a Kurti in the comments below - As she pointed out, in my understanding as well the ones with shorter lengths are called Kurtis and the ones which goes all the way down till the calfs are called Kurtas and are worn both, by men and women. 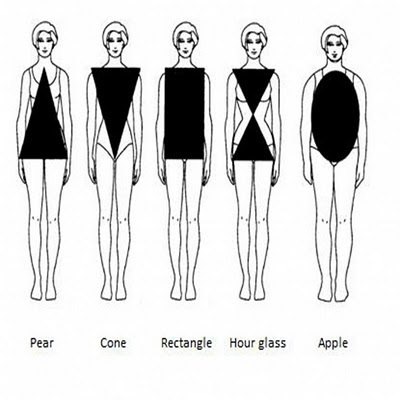 I really like the diagram of the shapes..I finally know what my shape is and how they determine in...Like I always thought I was ROUND (so borring) but now I know I'm an APPLE :-p Not any better though! You carry every look off with style. I love these outfits. As you know, I'm studying female-clothing of other societies and this is exactly the kind of information I'm looking for. You're a great cross-cultural resource. love the green and navy one with the purple bag! Thanks for the tips! This was definitely helpful! You have such a great knack for putting together the most amazing outfits which are always so different from anyone else! ah .. kurtis.. what a relief they are in the sweltering kolkata heat ..
P.S. you looking great as usual.. The left side is basically all my favorites of the bunch! I think I'd really like to try this look! I'll have to keep my eye out for one. Could I wear one with cut off shorts? Where is a good place to look for them? I'd love one like that pink and black one! OOOhh thanks for this post! I love your diagrams. I am kind of a sucker for things like this...psychology majors love diagrams. I love your black/pink kurti. Nice tips. I get my kurtis from Dallas, so its usually one at a time. I can't wait to see your new Kurtis from India. That will give me some ideas as to what's new, before I head shopping for more. My first time on your worl and I am sure I have to read a lot more. And and, you've like an awesome collection of shoes <3 *drooling* !! P.S. I am a footwear lover. Doubt I'd ever wear a Kurti or a Kurta, but this was a very educational post, and thank you for that! Interesting post and thanks for the advice. The kurti looks very comfortable. What an awesome post! 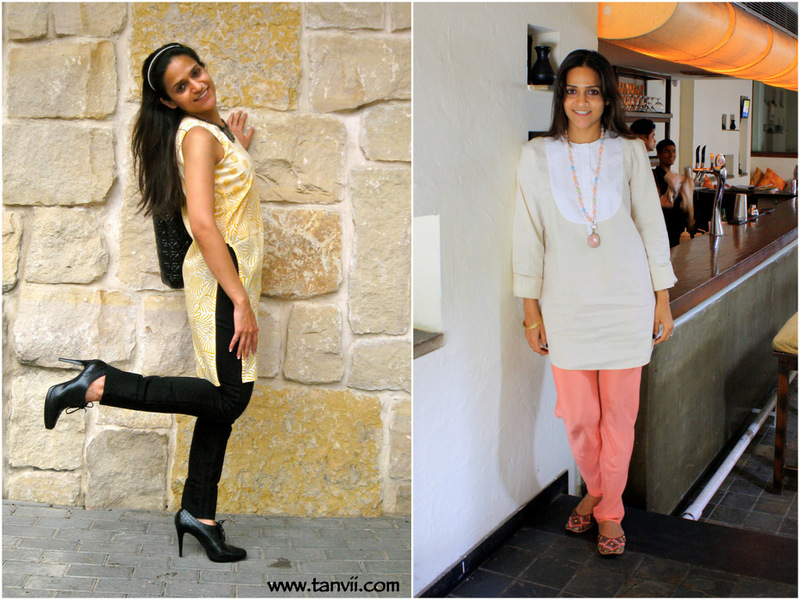 I love the look of a kurti...especially on you! Nice! All the looks suit you. Next time please help us complete the look,for each shape with specific kurti AND what type of pants AND what kind of shoes??? Oh the kurtis and colors back in India---wish I could have brought them all! This was such a fun post--looking forward to seeing your haul from India---I only brought back a couple of kurtis and about three salwars suits. My bags were packed withgoodies for the home this time! :D.
I didn't actually know they were called Kurti's. I have seen many of these in my travels and love how they can come in many different colours. nice...I like the black ..tunic..
all are good..thanks for sharing! 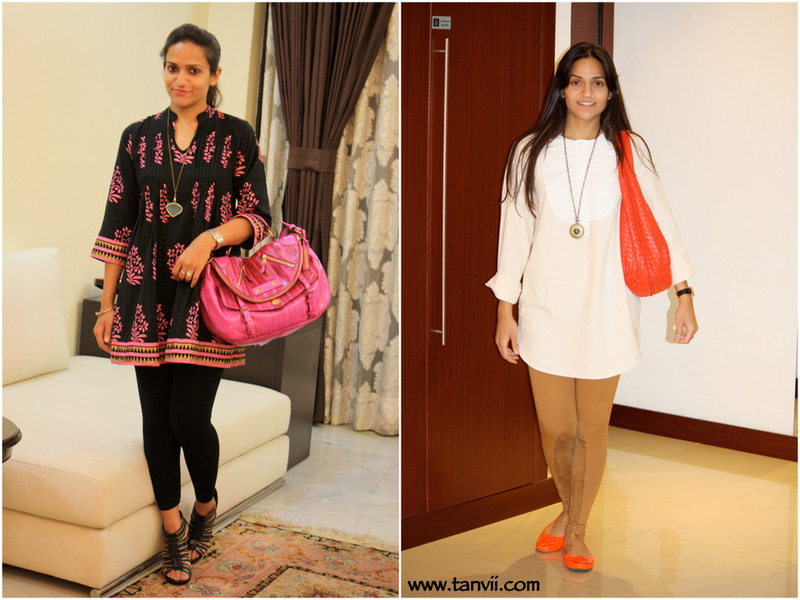 Thanks for the styling tips and now I know the difference between a kurti and kurta! p.s. Yes I knew the exercise/eat more thing was true but so interesting that females feel it more! Very nicely written, Tanvi. Coincidently I'm wearing a kurti in my next outfit post! Love the various ways you've worn kurtis. i'm so glad someone requested this because i really wanted to see how you styled a nice tunic. great job! love the 3rd one the most, specially because of the shoes! i love teaming kurtis with waist coats..
delhi is loaded with kurtis ! i think you've styled each kurtis very differently and every one of them looks amazing.i used to wear them with churidars, back where i'm from.amazing post!!!! All designs are nice and attractive do you want to more designs. check out latest desings here. Great article. 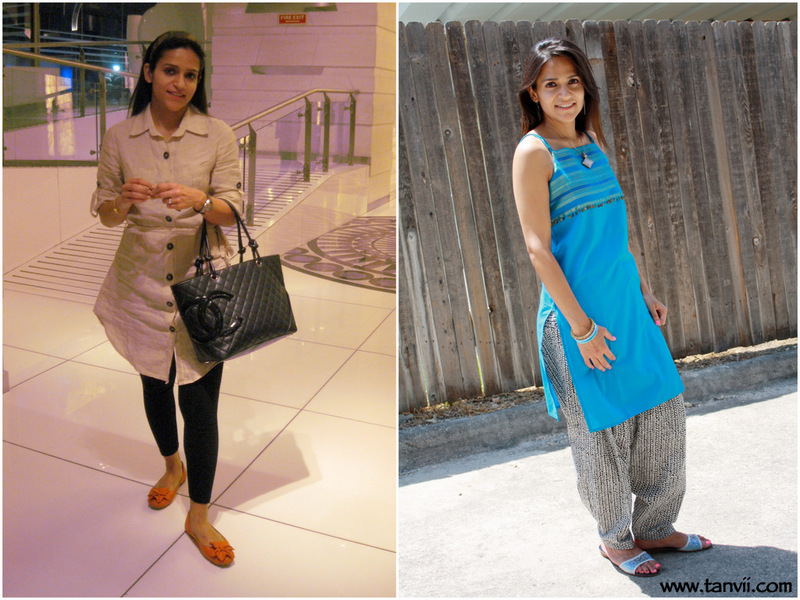 Always understood kurti above knee, Kurta below knee but both names seem to be used for either. What would be great would be advice on best style for older women. I am an hourglass (though overweight) but am also short, under 5', and over 50yrs old. I usually wear a calf length with 3/4 sleeves but was wondering if a shorter length would be OK in warmer weather. Most of mine have the side split though some are A-line but I think the anarkarli would be too much for me. Any advice because I can't be the only one with this problem.